Berta Cáceres Flores continues to speak to readers today in a black-and-white woodcut portrait that graces the cover of 13 colores de la resistencia hondureña / 13 Colors of the Honduran Resistance, 13 short stories and essays in Spanish and English, put together in honor of this courageous woman—“the unwavering warrior who from time immemorial has returned over and over again to lift up her rage, tenderness, voice and imagination against those who oppress, murder, belittle and deny life.” And it’s for all the brave Honduran feminists—Indigenous and Black, lesbians and trans, teens and grannies and many more. They are united by their fierce love for their children and each other, and ultimately for the freedoms they’ve been denied, and for their courage in confronting those they’ve labeled the golpistas—the perpetrators and supporters of the coup. 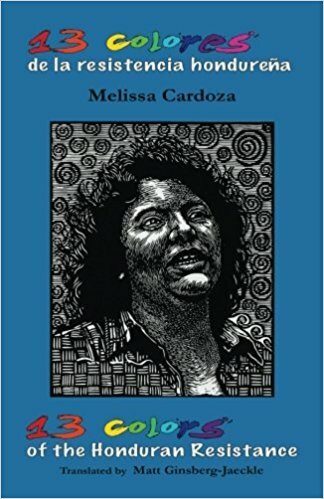 Originally written in beautiful, poetic Honduran vernacular Spanish by Melissa Cardoza and with a careful idiomatic English translation by Matt Ginsberg-Jaeckle—along with 13 black-and-white photos that visually highlight the diversity of the struggle—13 colores documents the resistance of all the abuelas, powerful sisters, and mamas who struggle to feed their children. Each piece begins with a black-and-white photo of Honduran girls and women in struggle, and facing pages show the Spanish on the left and the English on the right, so hablantes and English readers can compare line to line if they wish to. The one flaw here, something common in self-published books, is that it’s riddled with typos and one significant layout issue. 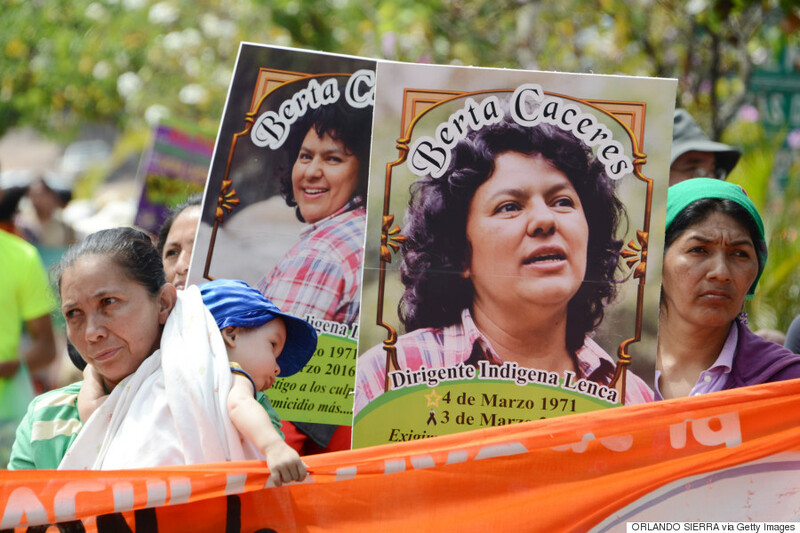 • Armed with only their brooms, rags, and gallons of bleach, a dozen women congregate in the center of the city in Tegucigalpa, doing what they do every day, only this time in the presence of journalists, soldiers and functionaries. This time they are chanting “¡A lavar, a lavar, la vergüenza national!” (“Wash the place, wash away the national disgrace!”) Soon, the pavement, the flags, the soldiers’ uniforms, everything is faded from the bleach. Cuando a la nieta que aún no ha crecido, su propia nieta le pregunte como era este tiempo: le contestará que era duro y poderoso. Que cada día se escribía a diario con los cuerpos resistentes de las indígenas, las negras, de los hombres y las mujeres que tenían la convicción fuerte, la palabra sin mentira, la risa sin permiso y el corazón tierno. Que las feministas luchamos con todo lo que sabíamos y podíamos para darnos a todos, a nosotras, a ellas y sus hijas, un país con justicia, sin miedo y sin guerra. Le contará entonces que ganamos. When the granddaughter of the granddaughter who has yet to grow up asks her about these times: she will answer that they were painful and powerful. That every day the day’s history was written by the resilient bodies of indigenous women, black women, of men and women with strong convictions, words without lies, laughter without permission and tender hearts. That we feminists struggled with everything we knew and gave our all in order to give to everyone, to ourselves, to them and their daughters, a country of justice, without fear and without war. Then she will tell her that we won. 13 colores de la resistencia hondureña / 13 Colors of the Honduran Resistance is highly recommended.